Student Enrichment: Roynon Elementary student council members and advisors present checks to aid the work of local relief and health organizations. They are from left, Mr. Scott Baur, Bruuno Snow, Emily Zerpoli, Drake Rubalcava, Jake San Miguel and Mr. Ray Delgadillo. Roynon K-5 kids may still be little, but they have huge hearts. How else can you explain the thousands of dollars they gave away this spring so that others may have a little more hope and happiness in their lives? 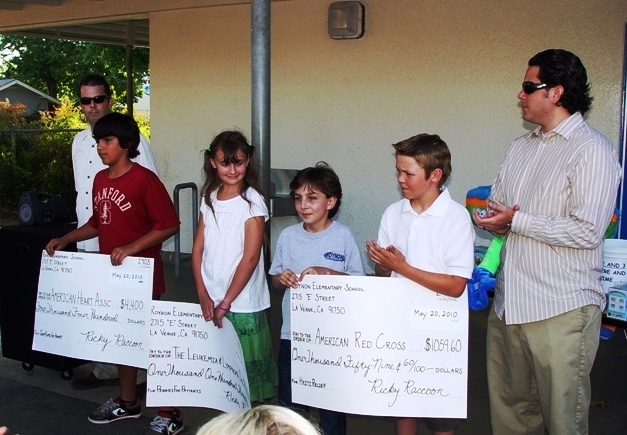 On May 20 at Roynon open house, students presented three large checks, each benefiting a local health or relief organization. Collecting their coins in a program called “Pennies for Patients,” students raised $1,103.87 and presented a check for that amount to the Leukemia and Lymphoma Society. In another fundraising program, students donated $1,059.60 from their Valentine’s Day candy gram sales to the American Red Cross’ ongoing Haiti relief effort. Normally, students donate the proceeds from their candy gram sales to a student council project. Then the students broke the bank when they presented the American Heart Association with a check for $4,400, much of the money coming from a school jump rope-a-thon. Over the last 13 years, Roynon has donated a total of more than $95,000 to the American Heart Association. On May 20, Roynon not only held an open house, it held the community in awe with its ongoing tradition of generosity and philanthropy, showing that even when you give a penny at a time, the result can make a huge difference to people in need.